Grand Opera by Puccini may seem an odd choice of performance by a cast of five soloists accompanied by a piano in a Parish church. 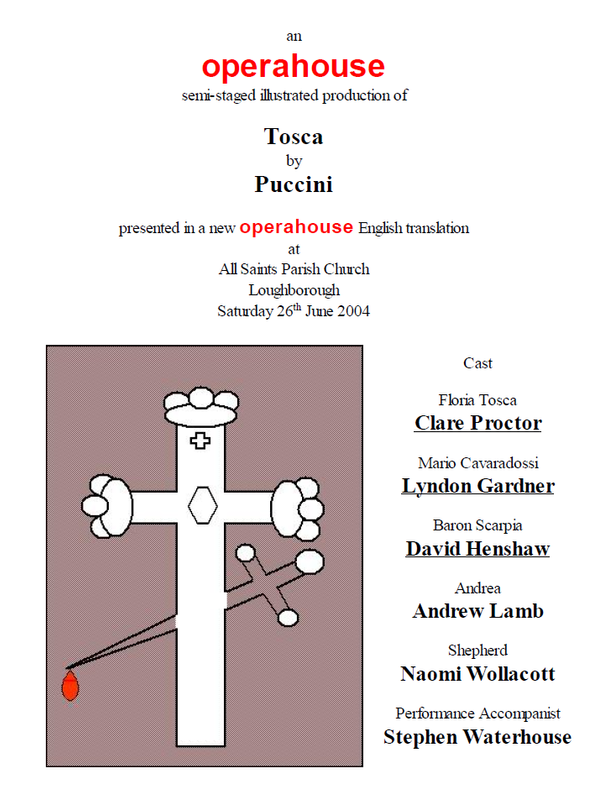 But in the event the inaugural performance of Tosca by Loughborough-based operahouse was a resounding success, and the All Saints Parish church an ideal venue as its stonework resembled the cathedral and castle required and it has splendid acoustics. The minimalist approach to sets in no way detracted from the drama as it unfolded over three acts and for those unfamiliar with the history or plot of the work each act was preceded by a short and often amusing introduction from Paul Blakemore which had the appreciative audience if not quite "rolling in then isles" at least laughing in their seats. The role of Tosca so notoriously demanding and Clare Proctor was equal to the task with beauty of tone and grasp of the character that brought some well-deserved applause at the end of her rendition of "Visi D'Arte". The villain of the evening, Scarpia was played with dignified menace by David Henshaw: his declaration that his love for Tosca would make him abandon salvation was a thrilling moment and the confrontation between him and Tosca at the end of Act two was a believable battle between the two, ending in his death. With two of Puccini's most famous arias in the role, the opera could almost have been called "Cavaradossi" and Lyndon Gardner proved himself up to the demands of the role; "E lucevan le stelle" was particularly poignant. In fact on more than one occasion those of us in the audience were drawn up into the drama to such an extent that while we wanted to applaud we were unsure whether clapping might detract from the moment. While Andrew Lamb played as many characters as his fellow singers combined his contribution as Andrea was somewhat smaller but in no way less impressive. His is a young voice that will go far. With no orchestra, the responsibility in the hand of Stephen Waterhouse was immense and with a player of lesser ability the risks may have outweighed the benefits. However there were no such worries with someone as accomplished as Stephen and the accompaniment was in perfect keeping with the singers. Act three began with an off stage aria by a shepherd boy, sung on this occasion by Naomi Wollacott, making an impressive operatic debut. In many ways this was a leap of faith to present a big art form in a small way, but it was one that worked extremely well. The next production from operahouse will be well worth looking out for.